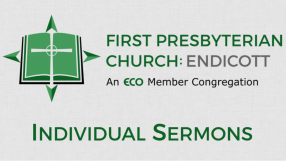 Paul Before Agrippa 9-13-15 from FPC Endicott on Vimeo. In Acts 26, King Agrippa asks Paul, “In a short time would you persuade me to be a Christian?” Paul answers him, “Whether short or long, I would to God that not only you but also all who hear me this day might become such as I am—except for these chains.” At our Fall Kickoff, we asked Derek and Isabelle to share their faith journys, whether short or long, and how they now live there lives to persuade others. Listen to their testimony.